Home » Review » Slimquick Pure Review: Is this the Answer to Women’s Weight Loss Problems? Slimquick Pure Extra Strength is a supplement specifically designed for women to lose weight fast. This weight loss supplement works by using its 6-point system that changes physiological processes in the body. The New Slimquick Pure Extra Strength is a supplement specifically designed for women to lose weight fast. It is one of the stronger fat burner products in the market today. As women find it harder to lose weight compared to men, this product has been formulated to counter such problems. We will discuss in this Slimquick review the important details related to this fat burner and weight loss product. This weight loss supplement works by using its 6-point system that changes physiological processes in the body. The manufacturer claims that its exclusive natural extract, AlloPure Green tea is so potent; making SlimQuick Pure the most effective female weight loss supplement. 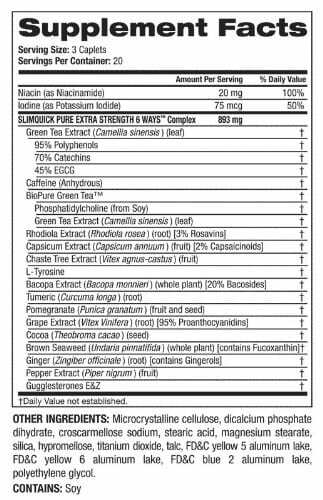 SlimQuick Pure has isolated the fat burning components in green tea to speed up the body's metabolism better than any unhealthy chemical ingredient. The exclusive AlloPure Green Tea extract allows for three times the absorption of fat burning agents called catechins. It is published in a clinical study to have helped overweight women lose 3 times the weight versus dieting alone, in just 13 weeks. Slimquick Pure Extra Strength caplets contain natural ingredients to give you the purest formula which is not harmful to your body. This product contains beneficial ingredients such as antioxidants, calcium, vitamin D and the brand's exclusive AlloPure Green Tea. A good way to curve my appetite. Great taste…I continuously repurchase, no side effects for me. These really work for me. I have lost 30 pounds, and it may not be 100% to their credit, but I think they work very well. These may be not everyone's top choice, but for me, they work. Great product for additional weight loss with diet and exercise. These gummies taste great with no aftertaste. I plan on ordering more this week.5 stars for product and service. Slimquick Pure is a weight loss and fat burner designed specifically for women. As women find it harder to lose weight and burn fats, this product can help solve these problems. It is still highly advised to include other methods like exercise and diet to ensure the success of the weight loss program. The users’ reviews are mostly positive with most of them saying that Slimquick works. The formula used is considered safe as its ingredients, even the most potent ones are considered to be too low if compared to other products used in losing weight and burning fats. You can purchase Slimquick Pure here. Caffeine Anhydrous: A caffeine compound that contains the bulk of its stimulating power. A highly potent nervous system stimulant. Catechins: Compounds that enable faster burning of fats. Niacin: Also known as Vitamin B3, it is generally used to maintain good health. It helps in lowering risks to high cholesterol levels and prevention of heart diseases. Iodine: Helps the thyroid glands produce hormones. Green tea extract: Used in the treatment of various illnesses. Most notable is its ability to decrease cholesterol levels and prevent heart diseases. Rhodiola extract: Reports say that this root extract can treat a variety of diseases. However, these cannot be proven due to insufficient evidence. Capsicum extract: Used in the treatment of various forms of arthritis and nerve disorders. Chaste tree extract: Used in the management of premenstrual syndrome. Bacopa extract: Has been proven to be beneficial to cognitive functions. Turmeric: Used in treatment of high cholesterol levels. There are no reported side effects for this product. It is advised to always take the recommended daily dosage. It is recommended that anyone who is pregnant, planning on becoming pregnant in the near future, or breastfeeding should not use Slimquick until they have finished breastfeeding their baby. It is recommended that you consult your physician before using Slimquick Pure as many of the ingredients have not been studied in pregnant or breastfeeding women and therefore the safety aspect of the ingredient is unknown. What is the difference between the previous formula and the new Slimquick Pure formula? The New and Improved Slimquick Pure formula does not contain Green Coffee Extract (per serving) and we have also removed some artificial coloring. The caplets are now white in color instead of the yellowish color for our Slimquick Pure Extra Strength Caplets and white in color instead of orange for our Slimquick Pure for Men caplets. Can I take other supplements alongside Slimquick? You can take more than one of our Slimquick Pure products together with any of our other formulas, however, you would take the recommended dose of each product 6 hours apart. Slimquick Extra Strength can be taken as a tablet, can be crushed or even broken down and mixed with water for an easier delivery method.